Whether you sauté, fry, sear, or make sauces, the Vremi Sizzlesauraus Sauté Pan handles all the heat in the kitchen. With its 5 quart capacity and 12 inch diameter, it can accommodate everything from small omelettes to big family stir fry meals. 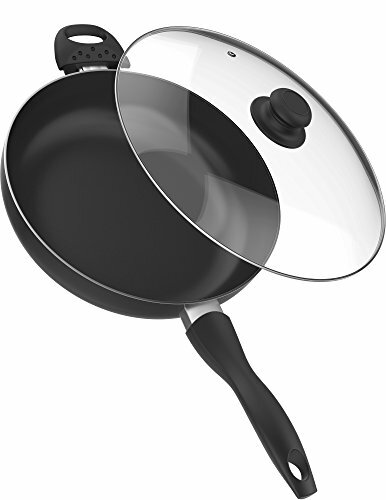 Includes tempered glass lid and heat-resistant bakelite handle for easy maneuvering while cooking. Crafted from durable, non toxic aluminum with double-layer non-stick interior, enameled exterior, and spiral bottom for even heating. Dishwasher safe for effortless cleaning.